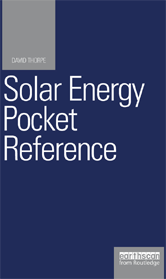 This handy pocket reference provides a wealth of practical information relating to solar energy and solar energy technologies. Topics covered include solar radiation and its detailed measurement, the emissivity and absorption properties of materials, solar thermal energy collection and storage, photovoltaics (both at all scales), solar cooling, and the use of solar energy for desalination and drying. 4.9.1 Fixed or tracking arrays?